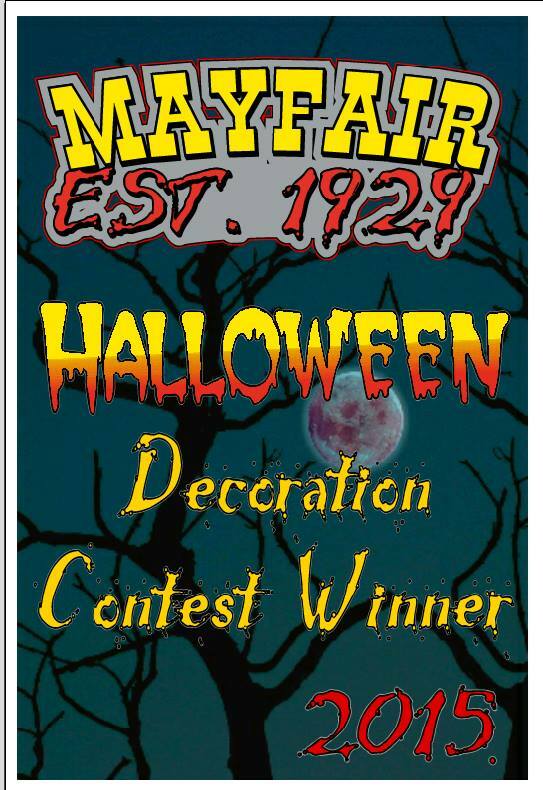 Tonight starting at 8:00, a team will be arriving at each winning home and will be presenting them with their prizes, and their Official Lawn Sign's indicating that they are indeed - '2015 Mayfair Halloween Decoration Contest Winners'! They have been extremely generous with their prizes for this contest - Please show them you appreciation and support! This is our 3rd year of hosting this contest and needless to say, it has been a huge success! We had just shy of 40 homes nominated this year, and well over 1600 views (and growing) on our Google Map! It is important to remember that this contest has been a success because we came together as a community, and each and every one of us has participated in one way or another. None of this would have been possible without the homeowners going all out and doing an amazing job of decorating their homes, without the nominations from our homeowners and neighbors, without our judges scoring each entry, without our Mayfair Business Association donating the prizes, and without the Mayfair Civic Association organizing the event and putting it all together. Working together as a community, we can continue to shine a positive light on our neighborhood, and we can continue to show that Mayfair is indeed - A Great Place to Visit, and an Awesome Place to Live! 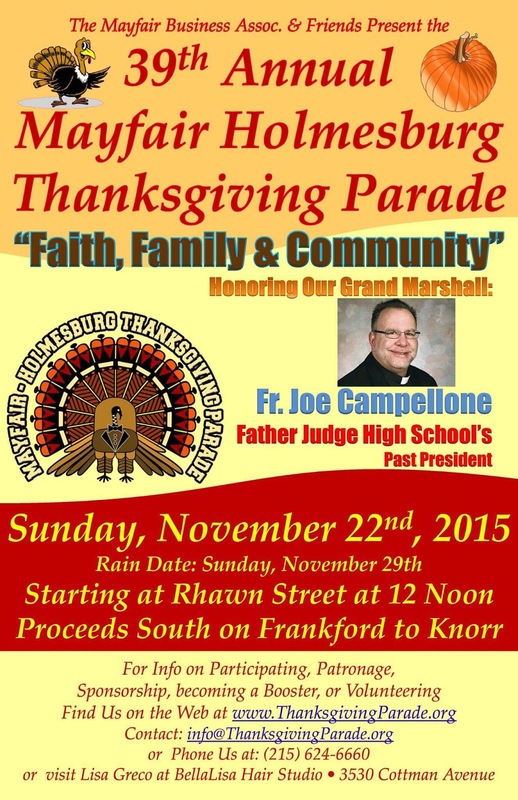 Start planning now - Nominations begin on December 1st! President"Mayfair - An Awesome Place to Live!" It is imperative that you attend the next Philadelphia 2035 Public Meeting being held at Lincoln High School THIS Thursday (October 22nd) at 7:00pm. Your attendance and input during this very important meeting will help to shape the future of our neighborhood, and bring the improvements to Mayfair that we have all been longing for. I look forward to seeing you all there, and hearing your thoughts and ideas on how you would like to see Mayfair in the future! For years we have voiced my frustration with cars going the wrong way up the 3500 block of Ryan Ave. We even had a story written about it in the last year. Last week was the straw that broke the camels back when we photographed a special needs bus driving the wrong way and into oncoming traffic. At first we were able to get more wrong way signs but that did not deter so we continued to bang on the streets department until our prayers were answered, thanks to an impromptu conversation, this week with the installation of flexible barriers. Thanks to all those that were helpful in this endeavor. It might seem like small potatoes but it could save a life! 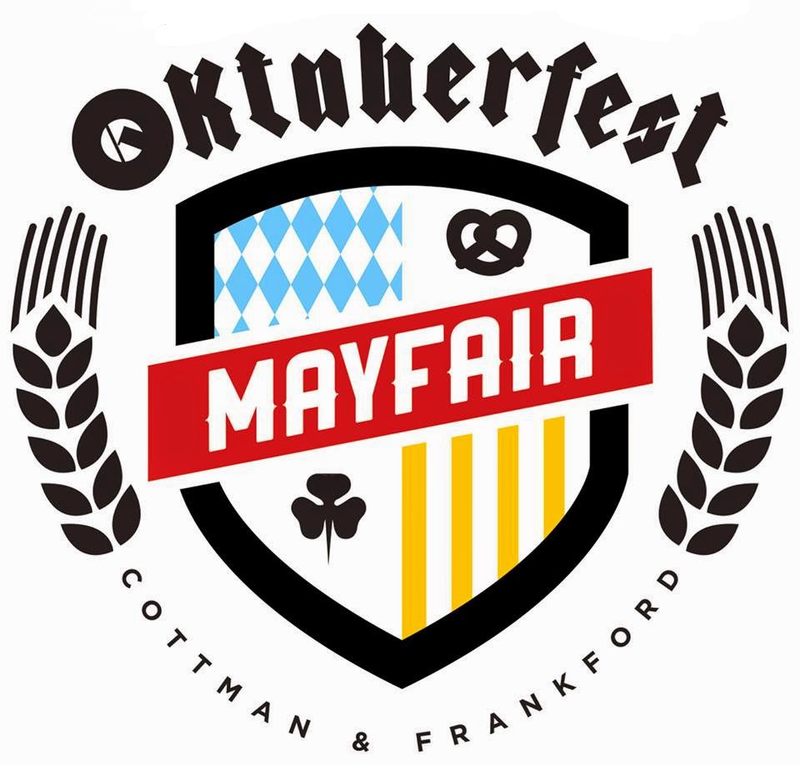 3rd Thursday Season Finale w/ Pop Up Beer Garden 5-9PM at Cottman & Frankford Aves. 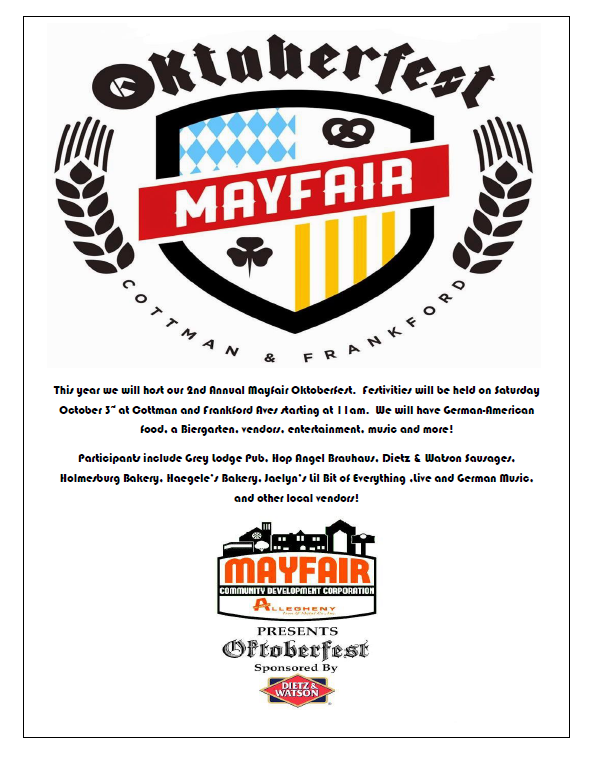 After getting rebuffed by the official night market organization, the neighbors of Mayfair decided to create our own monthly night market. 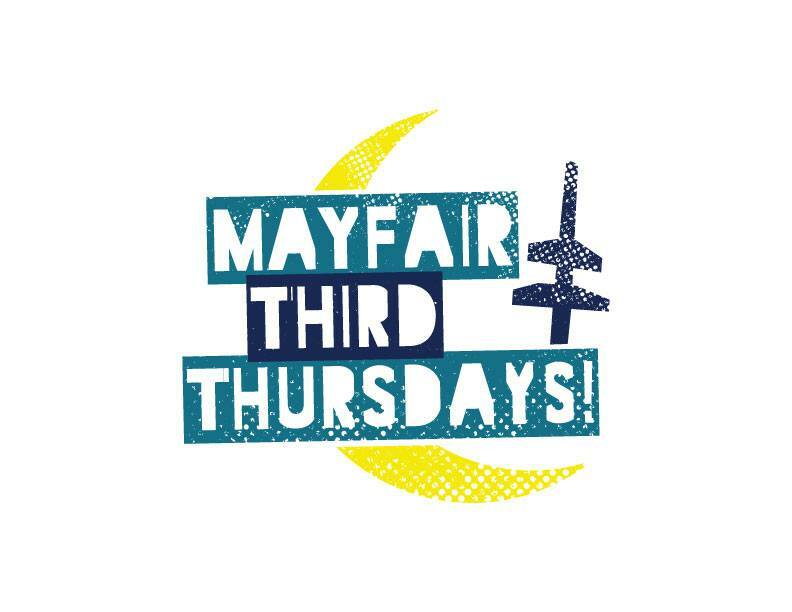 From June to October, the Mayfair Community Development Corporation hosts Third Thursdays, a monthly party to celebrate the community of Mayfair with a little bit of everything mixed in. Local businesses, a pop-up beer garden courtesy of the Grey Lodge, artisans, crafters, food vendors, live music and entertainment for the kids and families. Bring the kids out for some dinner, dessert or both! Stick around and listen to music, dance, whatever you want! It's summer, there are no rules! We'll have face painting and balloon animals and much more! 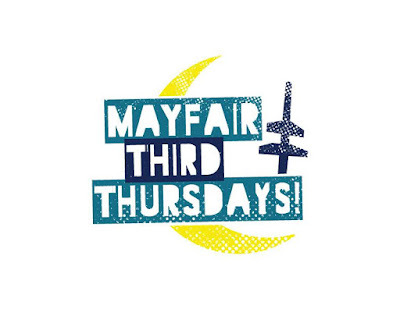 Third Thursdays are another example of Mayfair's vibrancy and can-do attitude. It's a great night in the neighborhood. Join us! Add to Third Thursdays to your . It's that time of year again ... It's time for the Mayfair Civic Association's Halloween Decoration Contest! 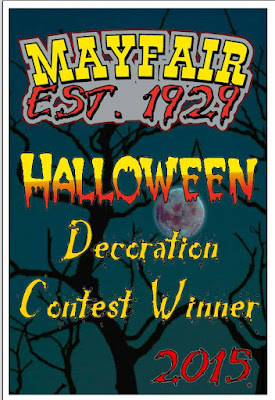 Working in conjunction with the Mayfair Business Association, we will be giving away prizes, and the coveted "2015 Mayfair Halloween Decoration Contest Winner" lawn signs to the 3 Best Decorated Homes in Mayfair! - Nominations will be added to our Google Map so that everyone can take a tour of Mayfair and see the eerie entries for themselves! 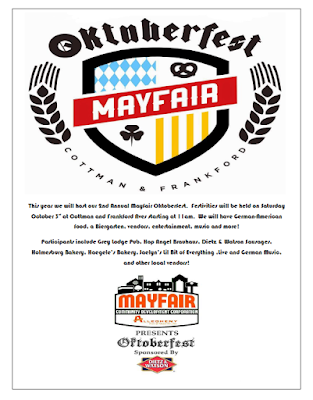 The map will be posted and updated daily on Facebook, and onMayfairCivicAssociation.com. As a courtesy to our surrounding neighbors who live outside of the Civic's boarders and are ineligible to win the contest but would still like to appear on the map, we'll be more than happy to include your home on the map as well for visitors to our neighborhood to enjoy! - Scare up the outside of your house with all things Halloween, and throughout the week of October 20th - 26th, our judges will be cruising around looking for the 3 Scariest / Spookiest / Best Decorated houses in Mayfair! - Prizes will be awarded to the 3 homes in Mayfair that best capture the Spirit of Halloween! 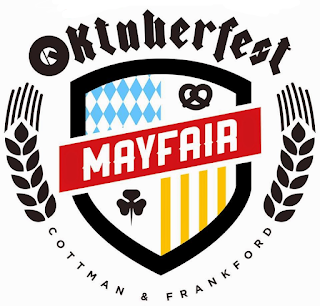 Together we can ensure that Mayfair continues to be a Great Place to Visit, and an Awesome Place to Live!